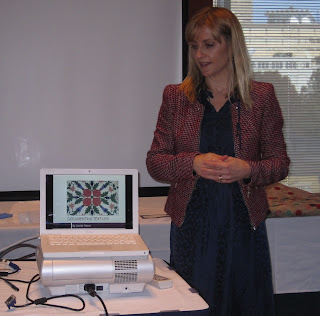 In a most interesting and comprehensive talk on Saturday 4th May 2013, Jennifer Palmer spoke about how we can document our quilts and store them in the best condition. She began by explaining why we should all document our quilts, giving us examples of the theft of quilts here and overseas. Such documentation provides evidence for future owners of an item and its provenance, and also provides a snapshot of its condition. She gave us each a Textile Documentation Worksheet, and using the example of a quilt in the National Trust collection, Jennifer worked through the different sections, explaining exactly what should be recorded and why. Apart from the obvious sections such as dimensions, image, complete physical description (so if lost or stolen, it could be verified), she told us how important it is to record the history of an item (including ownership, family stories and use information). As Dr Annette Gero showed us later with one of her quilts, research into the fabrics can prove or disprove oral history. Full description of a quilt is needed (quilt label, pattern, shapes, colour, materials used, style, construction techniques and type of sewing), along with a unique identification number. We often forget to include and update exhibition history (prizes, publications, collaborators, time taken to make, unique fabrics used etc.). We all agreed that for our purchased quilts and quilt tops, the provenance and valuation data should always be captured. Jennifer also pointed out that when describing any research into an item, it is important to document all sources of information, especially online sources such as Trove, so they can revisited for updates. 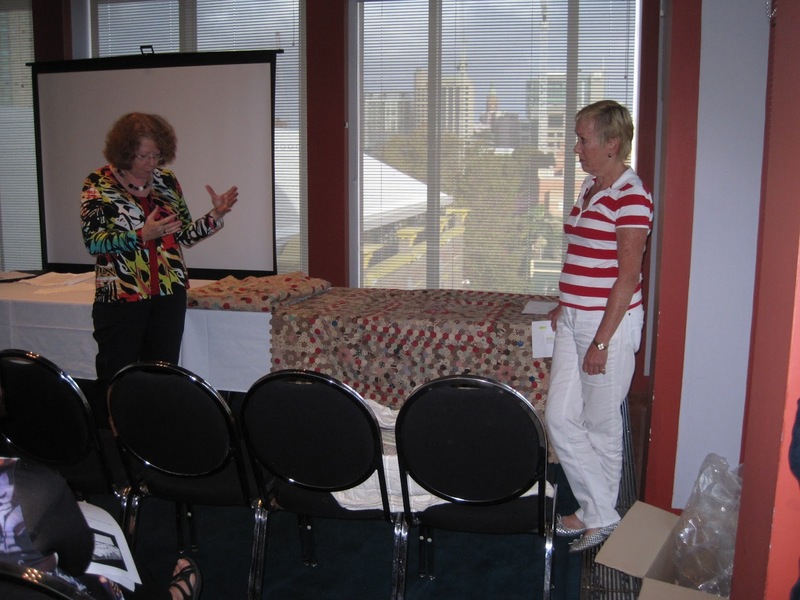 Later discussions covered the always controversial area of quilt valuation (both initial and subsequent revaluations), along with the storage, care and conservation of our textiles. We picked up valuable tips from Jennifer in all these areas, thanks to her extensive experience with collections. We were also given a list of conservation products and suppliers, along with valuable information about the Australian environment and appropriate pest management techniques. For show and tell, Sandra Lyons introduced us to Anne Seddon who showed us her wonderful family hexie quilt top (with intact papers), made in the late 1800s. 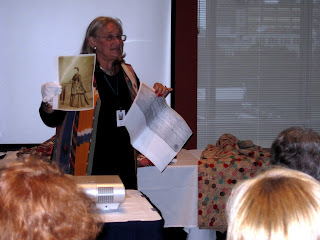 Anne spoke about her family history and stories of the quilt. Annette Gero also brought her example of a hexie quilt made about the same time by Mary Morehead. 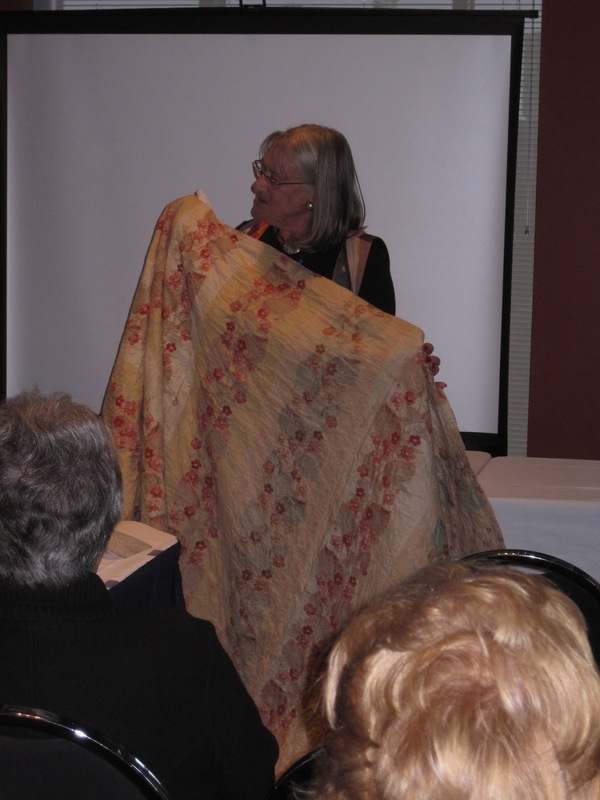 She spoke about how important it is to verify the family story of quilts by inspecting fabrics for clues, and by researching family history, such as birth/death/marriage data and newspapers online. 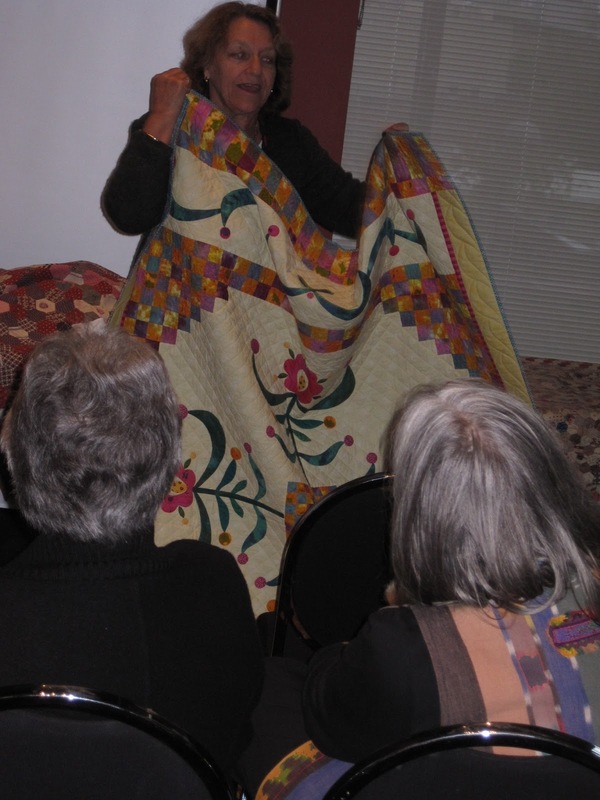 Karen Fail then showed us a more modern quilt made by her friend Larraine Scouler, which she purchased from the family after Larraine’s death. She spoke of the personal attachment she had to this quilt - it featured in her first book, “Quilting Back to Front” - and how this important detail could be lost if she had not documented it. 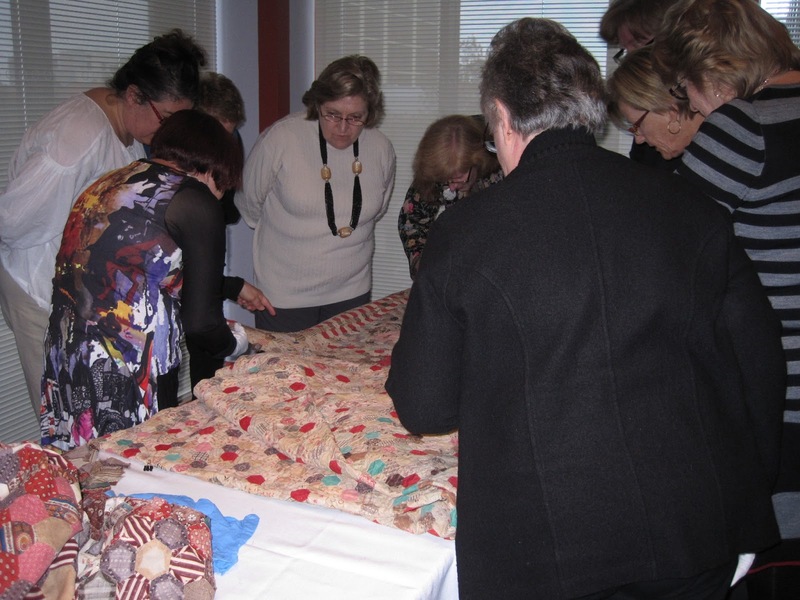 We finished the day by closely inspecting the quilt tops brought to the event. Here are 3 examples of hexie quilts, all made around the same date.